Even with Amir Khan moving on to a spring showdown versus Terence Crawford, it appears as if Kell Brook won’t be left empty-handed for very long. The services of the former welterweight titlist from Sheffield, England are being sought by Duco Events on behalf of its own former 147-pound beltholder, Jeff Horn. A proposal is in place for such a clash to take place in May, with Horn—a wildly popular draw in Australia—willing to travel to the United Kingdom. “I’ve got a text into Eddie (Hearn, Brook’s promoter) at the moment, my matchmaker has an email and a phone call into Eddie, we love this fight, to have Jeff Horn fight Kell Brook,” Dean Lonergan, Horn’s promoter revealed in an interview with Sky Sports on Monday. Both boxers cut their teeth in the welterweight division but have competed one weight class above in their most recent starts. Horn’s win was the far more celebrated of the two, although his 1st round knockout of countryman Anthony Mundine this past November left a trail of disappointment from those who witnessed the high profile event. Mundine was floored from what appeared to be a modest left hook midway through the opening round but was rendered unfit to continue. The bout took place at a catchweight of 156.5 pounds, the heaviest Horn (19-1-1, 13KOs) has ever weighed for a pro bout. It was his first since a one-sided knockout loss to Terence Crawford last June, ending an 11-month welterweight title reign which began with his massive upset—albeit widely disputed—points win over Manny Pacquiao in July ’17. The loss to Crawford marked Horn’s lone career fight outside of his native Australia and—for the moment—his last at welterweight. Brook (38-2, 26KOs) moved up to the 154-pound division following his 11th round stoppage loss to Errol Spence in May ’17, ending his near three-year welterweight title reign. He sat out the remainder of the year, recovering from a broken eye socket suffered in the loss before returning last May. The 32-year old has since scored two victories, both taking place in his Sheffield hometown. A 2nd round stoppage over Siarhei Rabchanka put Brook as the mandatory challenger to one of the titles currently owned by unified champ Jarrett Hurd. Efforts to close out the year on a high note instead drew mixed reviews, as Brook looked ordinary in a 12-round points win over Michael Zerafa last December. While he remains the mandatory challenger, a title shot doesn’t seem to be in Brook’s immediate future. Hurd is currently being groomed for a springtime showdown versus Philadelphia’s Julian “J-Rock” Williams. Secondary titlist Brian Castaño is set to face former champ Erislandy Lara in March and the next course of progression for recently crowned titlist Tony Harrison would be a likely rematch with Houston’s Jermell Charlo, whom the Detroit native dethroned in a heavily debated decision victory last December. Once-sought domestic rival Khan is set to announce plans for an April 20 ESPN Pay-Per-View showdown versus Crawford at Madison Square Garden in New York City. The bout will be formally announced at press conference to be held Tuesday in London. 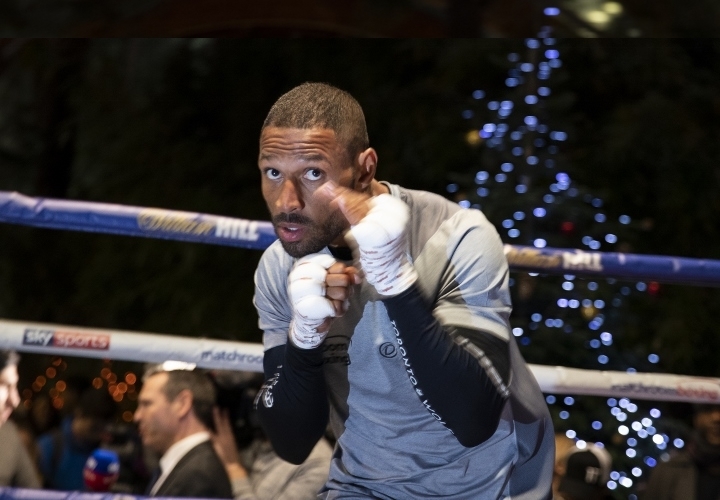 Short on noteworthy options for his next assignment, Brook could certainly do worse than entertain a clash with Horn—whose team is so determined to secure the bout, they’re even willing to concede hometown advantage.